A small selection of Slimming World friendly recipes. Syn values are approx, and you should always check with the Slimming World web site for accurate information. I decided with about 2 hours notice to cook something for the taster night at my Slimming World group. 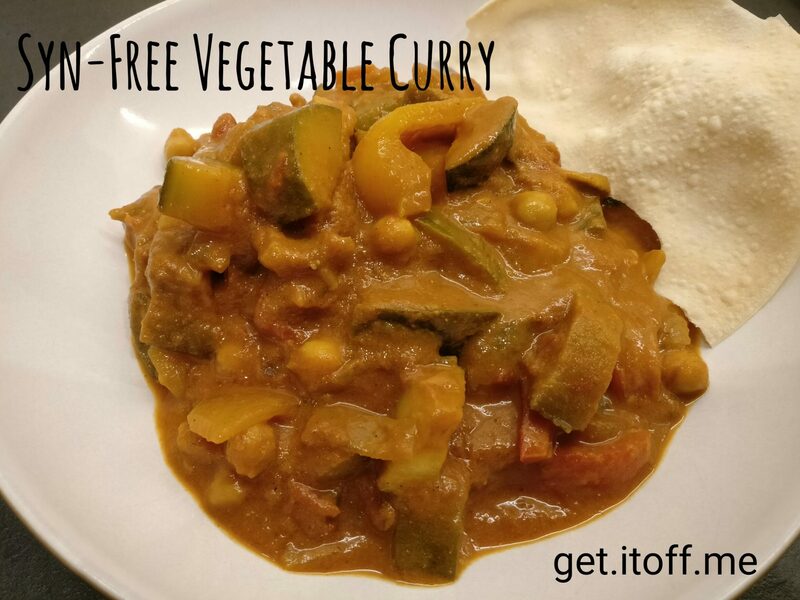 And for some reason I picked a vegetable curry – not something I had ever done before. And I’m not using any recipe, so it’s a bit of a voyage into the unknown. I just hope it turns out OK! Add a few squirts of Frylight / spray oil into a pan, and then added the onions and garlic, and fry gently for a few minutes until softened. Add the aubergine, courgettes, peppers and stir in. Add all the spices. Reduce the quantities if you don’t like your curry too spicy, or ramp them up if you want to blow your mind! Add the cans of tomatoes, passata and vegetable stock. Add the chickpeas and mushrooms. Stir, cover and simmer for 30 minutes. Taste, and if not spicy enough, add more spices. Stir in some fat-free natural yoghurt just before serving. Be sure not to boil the curry once you’ve added the yoghurt or it’ll curdle! Serve with rice, or just on it’s own. For the taster night, I’m taking along some Pataks Pappadums that are only 1½ syns each. 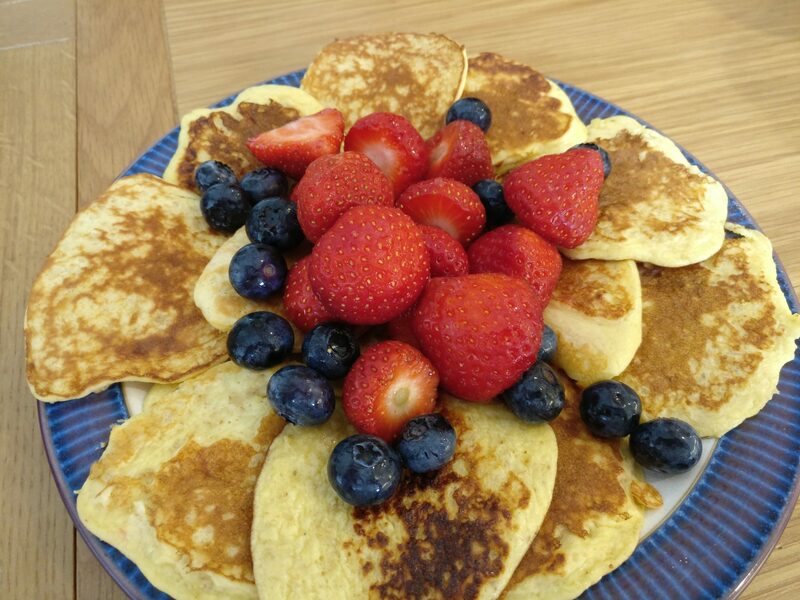 This is how I make up a batch of syn-free Oat Pancakes, which is enough for breakfast or dessert for 5 days! Once made, I wrap them up in individual portions and store in the fridge. The recipe uses your daily allowance of oats (35g 40g) which can count as your HEB (Healthy Extra B) or as 6 syns. Depending on the size of your dessert spoon, you should end up with about 60 small pancakes. Divide them into five portions, and you will have approx 12 pancakes per portion. Serve with slices of fresh fruit or berries if in season – or you can use the (defrosted) frozen berries as well. Try to pick fruits that are speed, in order to get your third of speed on the plate. For example, blueberries and bananas are not speed. So maybe use speed fruits like apples, oranges, blackberries, melon, raspberries, and strawberries. If you have a sweet tooth and spare syns, drizzle some maple syrup on top – 2 syns per tbsp. 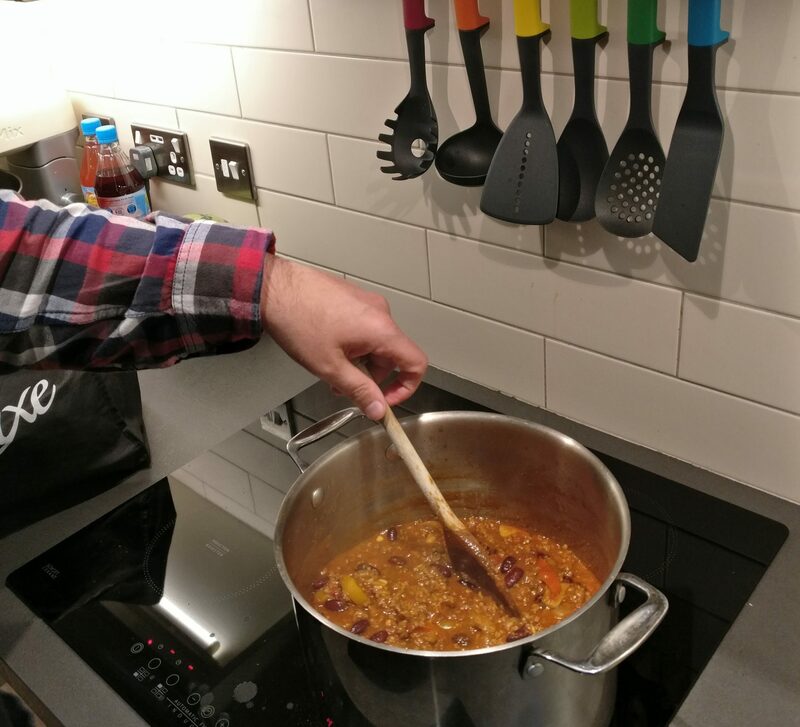 This is how I cook up a huge batch of syn-free Chilli Con Carne, which is enough to serve to your entire extended family, or maybe you might like to freeze in portions for future reheating. If you don’t need such huge quantities of food, then just halve the quantities! whatever other veggies you fancy or have hanging around – maybe courgettes, carrots, or celery. You can also add lentils if you like. Get a soup pot or large saucepan, spray some Frylight or Tesco 2 Cal spray in the bottom (5-10 sprays should be fine), and throw in the chopped onions and garlic, and cook on a medium heat for a few minutes till the onions look slightly translucent. Add the minced beef. Mash away at the mince with your wooden spoon, to break it down into little pieces. Cook for a further 5 minutes or until all the meat has browned. Add the chilli powder, paprika, cumin, coriander and salt. Give the pot a quick sniff at this point, because the spices smell amazing! The mixture is going to be a bit dry at this point, but don’t worry because we’re about to add some liquid. Add the tins of chopped tomatoes and the tomato puree. Stir well. Make up the stock cubes in approx 500ml of hot water, then add to the pot. Stir well. Bring the pan up to the boil, and then reduce the temperature till it’s simmering gently. Chop up all the vegetables that you want to add, and chuck them in when they’re ready. I like to use peppers and mushrooms, but you can add pretty much whatever you like. The idea is to bulk out recipe with as much speed as possible! Drain and rinse the kidney beans and add to the pot. Simmer with the lid on for a minimum of 20 minutes – but the longer you let it cook, the better it will taste! Just make sure you check the pot every 10 minutes and give it a stir. If it looks a bit dry, add some water. If it’s a bit watery, leave to simmer with the lid off. Serve with boiled rice, a baked potato, or some Slimming World chips – or just on its own if you’re avoiding carbs. If you’re going to freeze this, then make sure you defrost it completely before heating, and make sure it heats to the boil and simmers for a few mins before eating. Also don’t freeze if your meat has previously been frozen – because you’re not meant to freeze meat twice!